A steady succession of semi-trucks deposits 500 tons of waste each day into the 40-acre Guatemala City garbage dump. Workers scavenge through each truck’s contents for items to use or sell. This dump, one of the largest in the Western Hemisphere, takes in one-third of the country’s garbage. The medical waste disposed here poses devastating health risks to the 8,000 workers and their families who make their living and home nearby. Dump workers are the dalits of Guatemalan society, the most unwanted—murderers, criminals, the mentally unstable. Crime is rampant in this neighborhood. The city dump seems like an unlikely place to plant a church. But to one couple, it sounded like a perfect location. Dana Craft began short-term mission trips to Guatemala in 2007 but had no long-term plans for ministry there. Amid a series of debilitating health issues, he surrendered his career goals for the foreign mission field. Despite his chronic health condition, Craft and his wife, Damaris, moved to Guatemala City in June 2012 to minister to the least reached. They started A Mission Challenge, which seeks to faithfully instruct Guatemalan pastors, leaders, and church members in sound doctrine. Craft first planted the home church, Cristo Mi Redentor (Christ My Redeemer), 45 minutes from the dump. However, as he witnessed the immense physical and emotional needs of those living among the waste, he knew an on-site church plant was vital. Nuevo Amanecer (New Sunrise) now sits 100 meters from the dump entrance, ready to minister to the 500 families in the area. When Craft first preached at the church in February he told the congregants there weren’t enough donors to change their lives financially; the only thing that could change their situation is the saving power of Jesus Christ. In its short existence, Nuevo Amanecer has witnessed many changed lives. At a March 2015 youth event, more than 150 came to hear the good news and embrace Christ. Guatemala, the most populous country in Central America, has a long history of short-term mission groups preaching the true gospel message but not staying long enough to carry out discipleship. Thus, many Guatemalan believers have no roots and are easy targets for false doctrine. Guatemala feigns a Christian identity. With nearly 25,000 evangelical churches, according to Operation World, there is a church on nearly every corner, each filled with congregants eager to hear the pastor’s message. However, Craft warns against believing the 96 percent Christian adherence statistic, since many who identify as Christians have little to no understanding of the true gospel. He says seven out of ten churchgoers are illiterate and depend entirely on the teaching of the pastor for their understanding of Scripture. Sadly, many of these pastors are also illiterate; they merely repeat teaching they’ve heard from others, which leads to false or skewed interpretations of Scripture. “On a good day they preach a prosperity message,” Craft observes. “And on a bad day it’s the truth mixed with Maximón (an ancient Mayan idol).” In many churches a crucifix hangs next to Maximón, revealing an underlying tendency prevalent among Guatemalan churches toward mixing Christianity with cult practices. Craft also notices that many evangelical churches, in an effort to counter idol worship, have forgotten the grace that embodies the gospel. Instead, they focus on legalistic practices. A reformation is needed for the Guatemalan church. Because of a widespread lack of discipleship materials in the country, resources have been vital to the disciple-making process at A Mission Challenge. Through a Packing Hope project sponsored by The Gospel Coalition International Outreach (TGC-IO), Dana received Spanish translations of two books: The Gospel-Centered Life by Bob Thune and Will Walker, and The Trellis and the Vine by Colin Marshall and Tony Payne. Isaac, an orthodontic surgeon and pastor, approached Craft confused about sanctification after reading a portion of The Gospel-Centered Life. A believer for 10 years, he’d never been taught this crucial doctrine. After Craft explained it further, Isaac’s face “instantly reflected a blend of emotion, conviction, and the healing sense of God’s love.” Craft added that Isaac is now eager to share what he’s learned with those in his congregation. Craft envisions opening an academy in early 2016 to provide free formal theological training to pastors and leaders in the Americas. 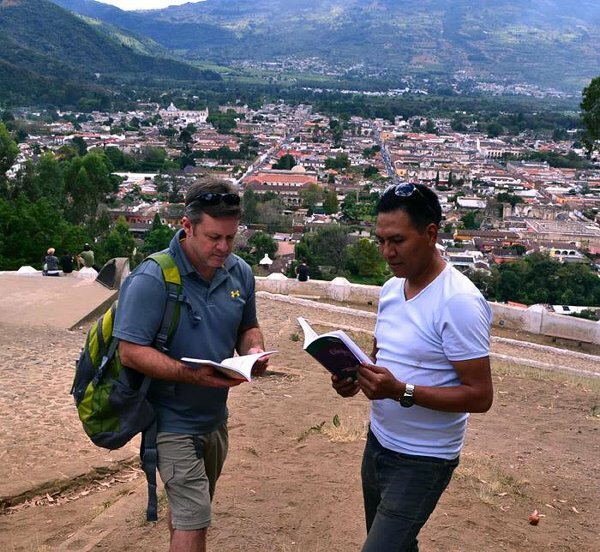 His growing personal collection of 700 books, half of them in Spanish, will serve as a rudimentary library to begin training these pastors. In time, he hopes to receive all of the Spanish titles available through TGC-IO. And some of those might end up in the hands of those at the garbage dump.